Foosball 2012, includes American and European style tables, customizations, ball types, and trick shots. The game’s World Tour Mode allows players to challenge opponents in 30 locations. Multiplayer-wise, the game supports local multiplayer for up to four players and online multiplayer as well. In online multiplayer, gamers can increase their rank until they become the table football champion on the game’s leaderboards. The game supports PlayStation Move and the DualShock 3. Vita platform controls are the same as DualShock 3′s controls, but with the addition of touch controls. 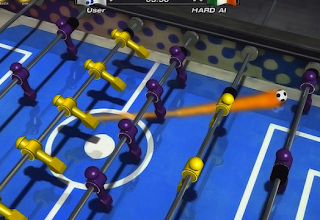 As for cross-platform play, Foosball 2012 supports cross-platform multiplayer (PS3 and Vita players can play against each other online, regardless of platform), automatic save data synchronization for those who own both versions of the game, giving players the ability to take their progress on the road with them. Also, players who purchase the PS3 version of the game on either platform will be able to play on both platforms at no extra charge. The same applies for any DLC for the game. Let us know what you think of Foosball 2012 in the comments below!